In the 1960s, Joey Skaggs found an antique cast iron bath tub with claw legs and brass fixtures on the street. He dragged it into his Lower East Side loft and filled the bottom with dirt, creating a terrarium to which he added an N gage electric train set, lizards, newts, and horn toads. He covered it with a glass top and had a coffee table that was far more interesting than most of what he could watch on TV. Almost twenty years later, while visiting Atlanta during the summer of 1983, Skaggs went to a privately owned toy museum when bad weather grounded him from flying lessons. Watching what people were attracted to, he noticed that people ambled, with barely a glance, past painstakingly crafted doll-houses under glass that kept them dust-free and out of reach. He figured they were just too static. Perhaps if they were filled with water and fish people would notice them. Skaggs soon filled his Waverly Place studio with bedrooms, bathrooms, kitchens, and living rooms for fish. 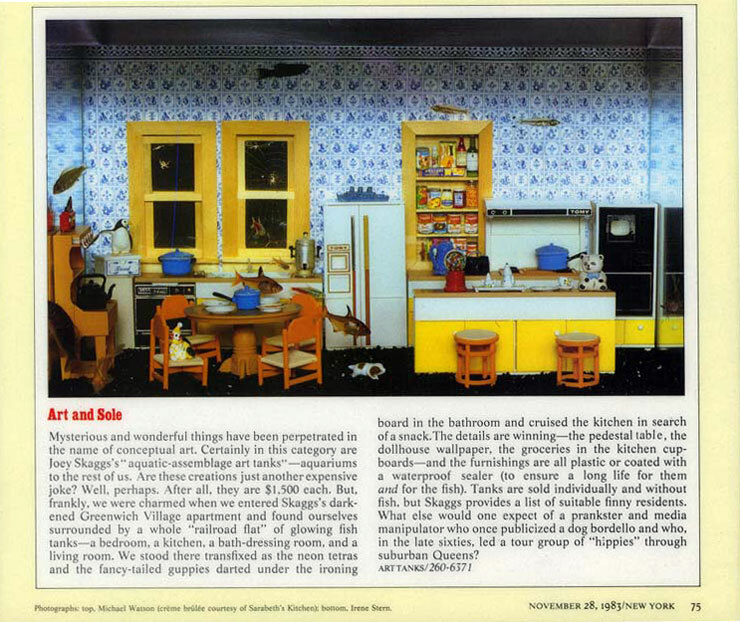 A call to New York Magazine “Best Bets” yielded a feature in the November 28, 1983 issue. 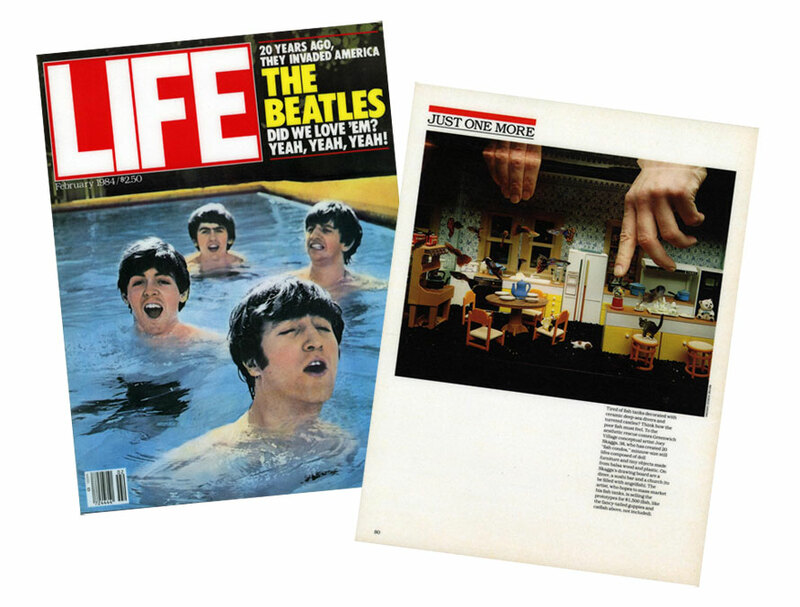 As a result, Life magazine, Good Morning America, the Merv Griffin Show, the Regis Philbin Show, Live at Five, CBS National News, and many other television shows and print publications covered Skaggs’ Fish Condos. This satirical statement quickly became a media phenomenon and was widely embraced by the New York art scene. In essence, the Yuppies Skaggs was satirizing became his greatest supporters. Fish Condos were exhibited in galleries and museums and were televised around the world. 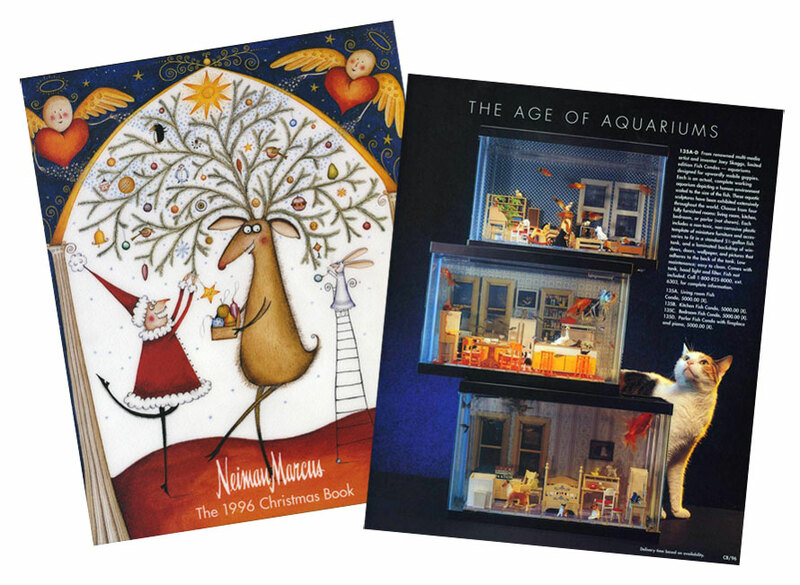 Buyers for the Neiman Marcus catalog pursued Skaggs for seven years, asking him to make his Fish Condos available in their famous Christmas Catalog. He declined each time because the tanks are individually hand-crafted and he did not have time to create large quantities. His desire was (and continues to be) to have them mass-produced and distributed for a far lower price than his prototype sculptures. 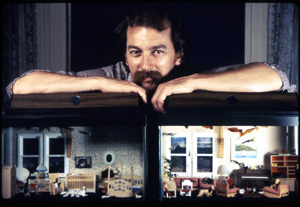 In 1996, Skaggs finally agreed, and the Fish Condos along with a Japanese Tea House Playhouse he designed were featured for sale in the Neiman Marcus Christmas catalog. To see more Fish Condos, visit Gallery/Fish Condos.